“People were very curious, and they wanted to know what it meant…,” said Rob Lentz, executive director of Project Onward and liaison for artist Louis DeMarco, in an interview with Newcity about the public response to the temporary installation of “Cloud Chart” along the newly opened 606 trail, the 2.8-mile elevated parkway connecting four northwestern Chicago neighborhoods. DeMarco’s artworks are among the new installations that will be on view through June 2016. The 606 has done a revolutionary job so far of transforming a fracture of urban blight into a dynamic, creative incubator and contemporary public square. Designed by a team of artists and civically minded creatives, it’s not surprising that the visual arts programming for the trail has demonstrated airs of thoughtfulness, inclusivity and magnetism. Caroline O’Boyle, program director for the 606, says, “Though permanent art works are not out of the question, since the 606 was conceived as a living work of art, the emphasis will always be on temporary artwork.” The opening temporary installations saw an intersection of local artists from varied backgrounds and mediums, and differing levels of history with the site. The final result, imagined and realized, was to create a nirvana of imagery to celebrate the cultural life, creative undertone and community of Chicago. The opening temporary works fell comfortably into the framework and friendliness of the trail. Thought-provoking without being academic, every installation created a mood of approachability. 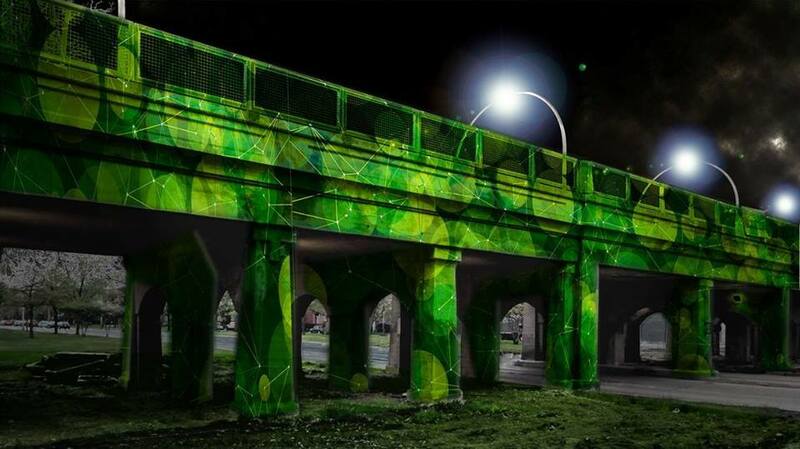 Luftwerk’s “transLIT” lit the Humboldt Park onramp at nightfall the first two nights of opening weekend, calling attention to the entrance along the trail. Louis DeMarco, an artist with autism represented by Project Onward, created a three-part mural for Churchill Field Park, “Cloud Chart,” “Pay Attention” and “Halo Chart,” providing moments for reflection, relief and connectedness. 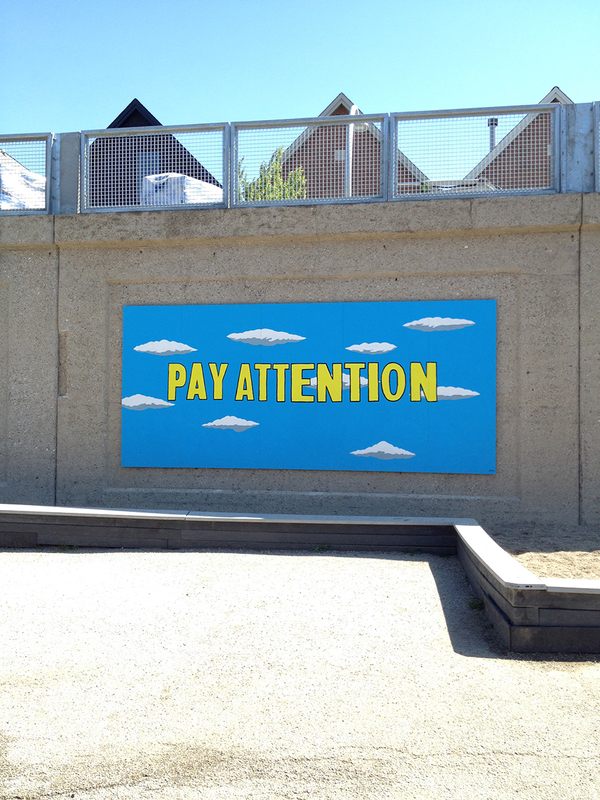 “Pay Attention” wall mural by Project Onward artist Louis DeMarco, installed along the 606 trail. “I hope that the [Cloud Chart] murals help the public think for themselves. I believe that we can all identify with romantic disappointments, and that we can all come up with our own chart entries tailored to our personal foibles and experiences. I hope the murals can make people laugh, and nothing is as soothing as laughter,” said Lentz. You can walk along the trail to see other temporary installations for the opening season, which will be up until June 2016, by acclaimed local and contemporary artists. Kay Rosen’s “Hi” sits at the billboard on Milwaukee and Leavitt. A Graffiti Garden was created by a collective of longtime muralists and local artists called Kuumba Lynx, and sits along the south-facing walls on Bloomingdale between Central Park and Kimball. A new take on an old mural, “Children Are Our Future,” was created by Chicago Public Art Group artists John Pitman Weber and Catherine Cajandig alongside Youth Service Project. Chakaia Booker, known for her sculptural work repurposing tires, created a piece at the Damen Arts Plaza that is expected to be installed in late July 2015. For opening day, the Trust for Public Land collaborated with more than a hundred local arts groups and, through its anchor partners, hired over 300 local artists and musicians. This looked like a smorgasbord of live performances and participatory community arts projects by local public arts groups, including Opera-Matic, known for their musical art parades. 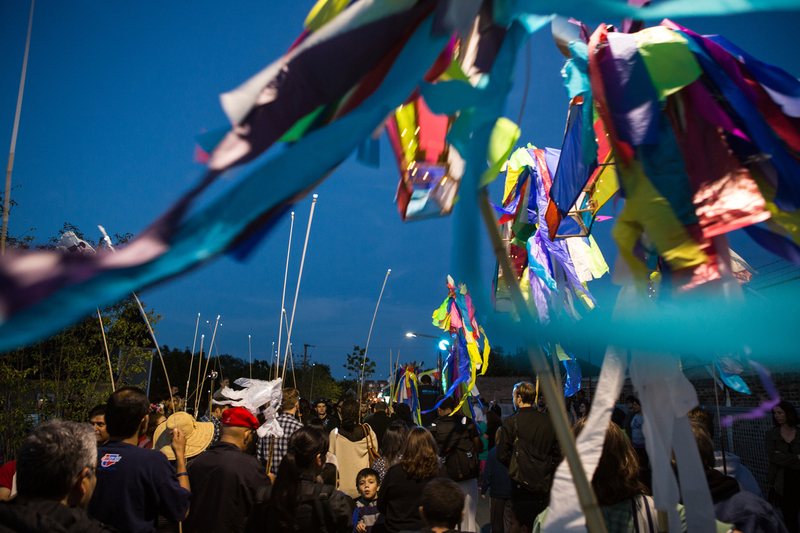 Opera-Matic invited dozens of teaching artists and high-school students to facilitate community flag-making workshops to sew flags to use in the musical processions. Art director Laura Miracle of Opera-Matic explained, “The flags grew out of our desire to merge movement, visuals and community. We felt flags were a great statement: ‘We are here, look at us!’ which seemed relevant to the issues surrounding change and gentrification. This iteration of the flag workshops was strong in how we built a community of teaching artists by asking them to reach out to people that they knew. People were impressed that we had sewing machines in the park and were teaching people how to use them. It is this simple technology that is getting lost… so much of what I am interested in is in that: people are losing touch with how things are actually made.” Opera-Matic also produced mobile sculptures to use in an ornamental second line, featuring poetic imagery of animals moving in packs, taking art on a walk. “Through support from the Reva and David Logan Foundation, the Trust for Public Land is planning a series of quarterly celebrations that will include musical and visual spectacle,” O’Boyle confirms. The Exelon Observatory, a feature of the trail that marks the position of the sun created by lead artist Frances Whitehead, will enjoy its first celebration on the solstice, June 21, at sunset. Another trail-wide celebration is expected to take place on September 26.